Silver Street continues past the barricade and under the Mississippi River flood water in Natchez. Most of the side roads and some of the major highways in the South Delta look just like this small section of Silver Street. So I guess we can add 2019 to 2011 and 1973 as exceptional flood years in Mississippi. When you grow up along the Mississippi River as I did in Greenville, for the rest of your life anytime you get near it you hear your father gravely warning you, “That River will kill you.” When my dad told me that I’m pretty sure he was counting on me storing it in the “good advice” side of my brain and not in the youthful “let’s-make-that-a-challenge” side. I obviously heeded it or I wouldn’t be writing this now. His words whispered to me again the other day as I parked my car at the barricade on Silver Street at Natchez Under The Hill and walked to where the flooding Mississippi was boiling over its banks into the low dip where the Lady Luck Casino used to dock. My path was only a few feet above water and just a few feet from the bank. The current was angry. And close. I remembered not to stray near it. Nearly a hundred yards of floodwater lay beyond the barricade over Silver Street. It had to have been at least three feet deep at the low spot. Another set of identical barricades blocked the far side of the flood. After that the dry pavement again emerged from its impromptu bath and continued its way on up the steep bluff. Natchez sits high enough up above the Mississippi that not much of it is affected by floodwater. Up at Vicksburg however, a whole neighborhood is in the backwater area frequently flooded by Chickasaw Bayou across from the National Cemetery in the Vicksburg National Park. The Cemetery and the Park are on that first bluff above the river. Chickasaw Bayou is at the bottom of the bluff on the very south end of the low, flat Delta. The lower Delta is really getting it again this year. It’s a double punch. There was a lot of rain over the entire Delta this winter. And about the time that rainwater was to drain from the lower Delta into the Yazoo and then the Mississippi Rivers, there came a flood down the Mississippi. So when the Mississippi, where the Delta back water is to empty into it, is as high or higher than the water that is to flow into it, there’s nowhere for all that Delta rainwater to go but to back up and flood inside the levees. So as the water in the Delta crept northward and grew deeper the flood of 2011 began to be mentioned quite a bit, the last worst-flood in the Delta. As the water deepened further, the 1973 flood started creeping into the conversation, the worst flood since 1927 in the south Delta. I did a high water story for WJTV in the lower Delta in early March. Not grasping the magnitude of the flooding that had already taken place, I imagine mine was one of the last automobiles to actually make it from Holly Bluff to Satartia before the road became completely impassable. And I only had one lane out of the water in places. It never occurred to me the flooding was already that bad until I got into it. And yes, I heard Daddy’s voice again as my road seemed to sink closer and closer to the edge of the water until it was just a spit of asphalt before me, raised ever so slightly above the lapping floods on either side. Next time I look out and see that I’m in the middle of a cypress bayou I want to be in a boat, not my car, and preferably with a fishing pole and not a camera. Walt Grayson is the host of “Mississippi Roads” on Mississippi Public Broadcasting television, and he is the author of two “Looking Around Mississippi” books and “Oh! 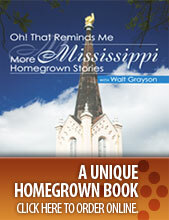 That Reminds Me: More Mississippi Homegrown Stories.” Contact him at walt@waltgrayson.com.